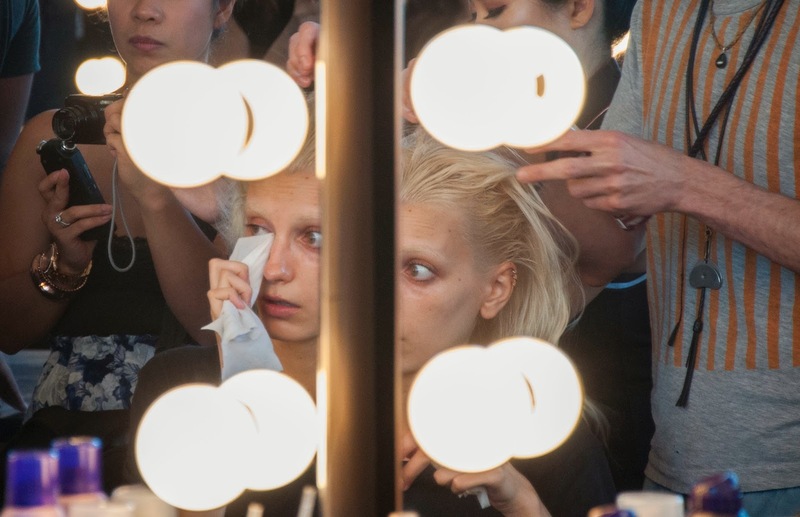 It occurs to me that I've never actually written about what being backstage before a fashion show is like. Each person's experience is different, of course, but here's what mine is like. Perhaps the one cardinal rule to remember about every show during Fashion Week is that no show starts on time. If a show is marked to start at 1pm, it will actually start around 1:30, sometimes later if the designer is especially fabulous (or just...running really late). Personally, I've never waited more than 45 minutes. That being said, call times backstage (when I arrive) at a show are usually two to three hours before its slated start time. Yesterday, for example, showtime was 2:30pm, and backstage call time was 11:30am. And even before I get there, people are already swarming. A desk is set up with two young gals in black, probably interns, checking people in. If it's at the Mercedes-Benz Fashion Week tents at Lincoln Center, I'll get a backstage pass tag in a color and or pattern for that designer (each designer has a different color so they can't be duplicated and used for another day by sneaky folks). If it's off site, as many shows are these days, in event spaces or galleries, I'll be given a bracelet or simply be allowed to roam free with my camera. I'm usually there to photograph backstage beauty for Her Campus.com, which, as I've written before, is the magazine for which I am the style editor (follow my NYFW exploits here if you like!). The PR companies who have brought me there represent the brands being used on hair, nails, skin, and/or makeup. I try to wear all black so I blend in and people ignore me because I find I get better pictures that way. When I arrive, I immediately find a place to plonk down my massive black leather bag, which I have unofficially dubbed my Fashion Week bag. In it, I have any and all sorts of things I might need for the day: memory cards for my camera, phone charger, a Luna bar for when I get hungry, and sometimes my laptop if I have lag time between shows, or even a pair of heels. But usually not because during Fashion Week I tend to dress like a grunge/punk version of an Olsen twin (post- Full House, pre- The Row), with a black cashmere beanie, a long black cardigan, and lots of black eye eyeliner. I take out my camera and my phone and I begin shooting. The clothes I like to wear during Fashion Week don't usually have pockets, so I end up shoving my phone in my shirt so I can snap pictures for Twitter pretty easily (#nyfw). I'm ducking in between models having their makeup done, wedging myself in between the stools or chairs on which they sit so I can get some interesting shots. I inevitably bump into a makeup artist and say sorry--I always feel bad for doing this because I'm very much invading the space they need to do their work. But we all need to coexist, I guess, because my work allows their work to be seen, so...symbiosis? Sometimes I'll see another photographer I know and we'll hug and make chit-chat briefly. Then, more shooting. I'll also have introductions to the hair stylists and makeup artists at the show, and I listen to them talk about their inspiration, how they took the feel of the designer's collection and made it into a ponytail or a swoop of eyeliner (this is my favorite part, because I love seeing how people's minds work in their own creative niche). I watch hair get teased, weaves added to too-thin manes, hair sprayed and sprayed again with thickeners and conditioners and oils and gels. Nails get polished and unpolished, on the toes and the fingers, cheeks are rouged and lips darkened and eyes glittered, all from scratch, or sometimes not from scratch when a model has come directly from another show. Sometimes they're late and everyone has a heart attack. All the while, more interns stuff goody bags and place clothing lists on each guest's seat. Models will take the tiniest plate of food available and fill it with grapes. I will snitch a half a bagel someone's torn off or a zucchini stick and the PR girls who brought me there will sneer at me. Sometimes there is boxed water or Vita Coco, but at Lincoln Center there's infinite Diet Coke because the brand is a sponsor. "I haven't even straightened her hair yet!" --but they always finish in time. All the while, I am taking pictures, trying to challenge myself to see something I haven't seen before. Once hair and makeup are finished, it's time to get dressed! Dressers help the girls into "First Looks," the first outfits they will wear on their first trip down the runway. They steam the clothes, lint-roll them, and put sticky tape where there needs to be sticky tape. If they have an outfit change in the show, the dresser will help change them quickly without damaging the clothes. At that point, I go into the audience and wait for the show to begin--I don't like to take pictures backstage at this time because I feel it's a violation of models' privacy. I mean, they signed up to be photographed, but not while they're naked, you know? At least not today, anyway. So I go and sit and everyone's noisy and running around backstage while people are filing in to sit in the front of the house. Extra special people are photographed with bright white flashbulbs from their seats in the front rows. And then the lights dim and the show begins. I watch. And 15-30 minutes later, it's over. Until next season, anyway.